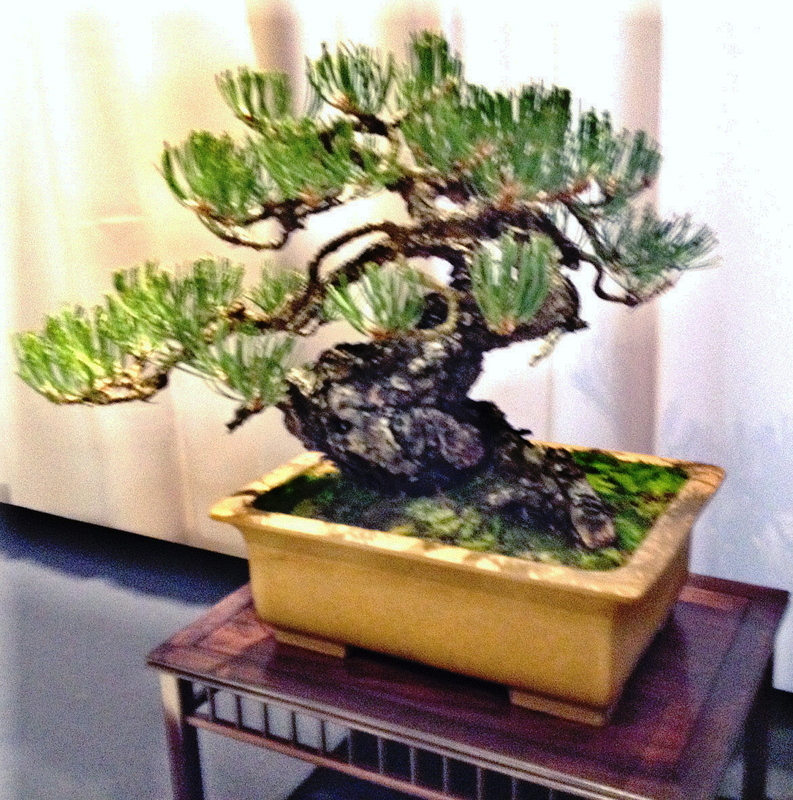 Trucking Buddies Stumble Upon a Bonsai Show – Johntheplantman's stories, musings, and gardening. Dekie was studying the road atlas. She said, “Look, here’s a mention of what looks like a small botanical garden. Maybe it would be fun.” We had spent the night in Nashville on our way back to Georgia from the trip to Iowa—not because it was Nashville, but because it was a good place to stop. I’m always game for a garden and we went looking for it. I’ll admit that we are a bit naïve and unaware at times. Neither of us knew that Cheekwood was a magnificent museum and garden on the U.S. National Register of Historical Places. 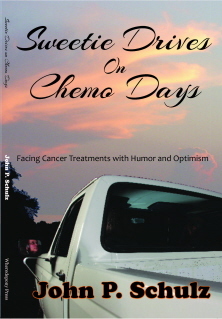 I plan to write at least a couple of articles on this adventure. It was quite an experience for a Georgia boy and his sweetie. 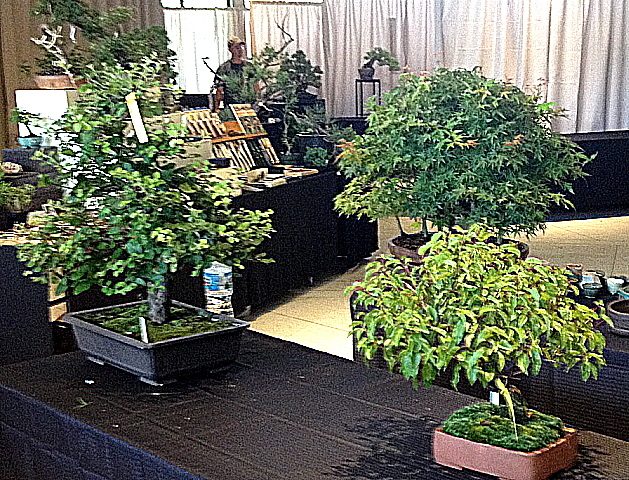 After paying a parking fee and another admission fee, we looked around and found that members of the Nashville Bonsai Society (or whatever they call themselves) were setting up a very nice show just for us. 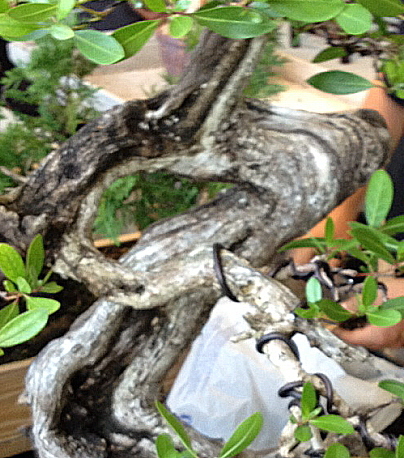 One of the more tedious techniques for shaping the plants is wrapping and bending wire to get the desired shapes. 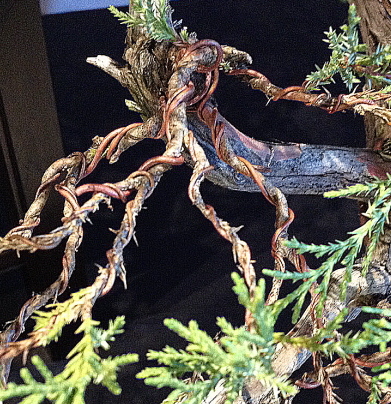 Copper wire is heated to gain stiffness and is then wrapped carefully around trunks and limbs. 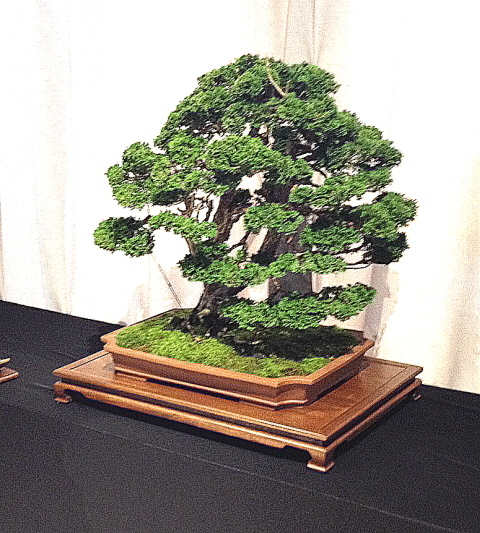 The bonsai process is totally detail oriented. At first glance we see and appreciate the overall shape of the tree. On closer inspection, though, we notice deeper and deeper layers of detail such as in this carefully formed and aged tree trunk. We were enjoying the tree below when an “old guy” started telling us about it (to me “old guy” is my age or older and should usually be listened to and venerated). 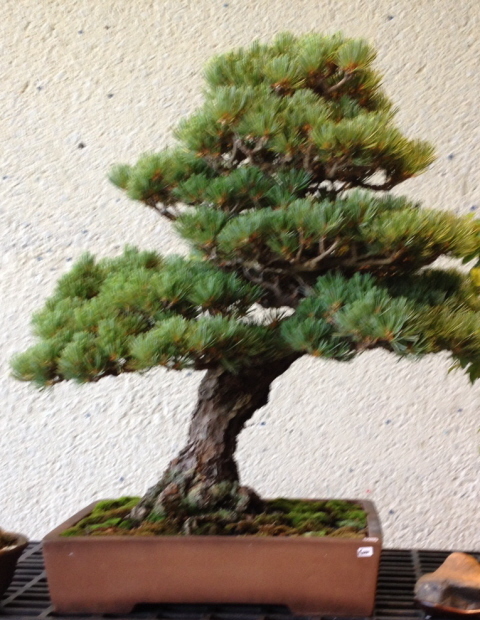 He told us that the tree had been found and transplanted from a nearby mountaintop by one of their members who had served as a bonsai apprentice in Japan. I asked him what it was like to be a bonsai apprentice and he replied, “There is little or no pay, they work you like a slave and they don’t feed you.” I remember the part about getting fed. 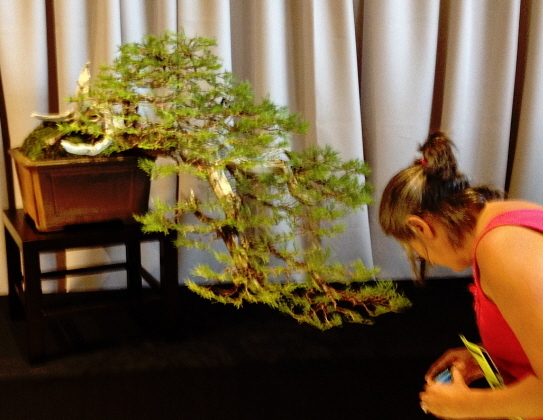 Dekie is working on a juniper cascade at home and she was interested in the overall shape and size of this specimen. I have decided that the next plant I purchase for myself will be a Hinoki cypress—which is really not a cypress but a “cameacyperus” or false cypress. 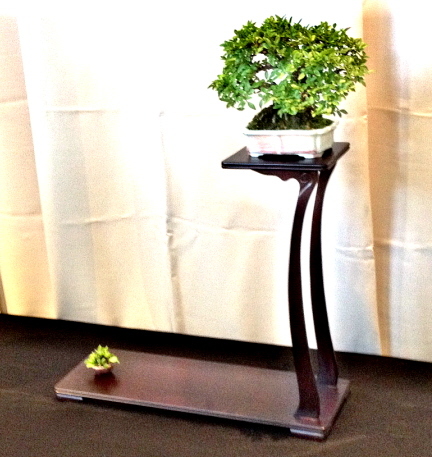 Here is a picture of a bonsai Hinoki. I also like them when they are allowed to get big. I was rather taken with this three-piece arrangement. The artist will spend quite a bit of time adjusting all three of the components to just the right placement and orientation. A good thing to know is that these arrangements are NOT house plants and that they are NOT static. The plants are usually grown outside or in a greenhouse and moved inside the home only for short-term display. Pingback: Trucking Buddies find Giant Insects | Johntheplantman's stories, musings, and gardening. 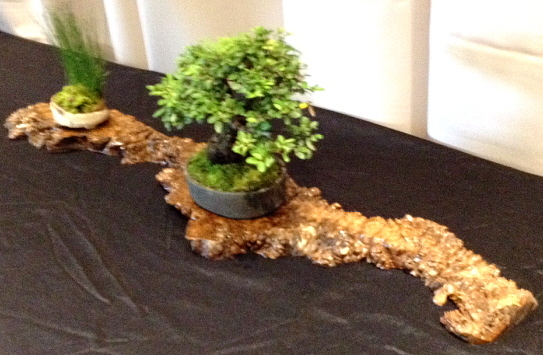 Pingback: Plant a bonsai on a mountain side in a shallow dish | Johntheplantman's stories, musings, and gardening.